Get an INSTANT price for your wheel alignment. 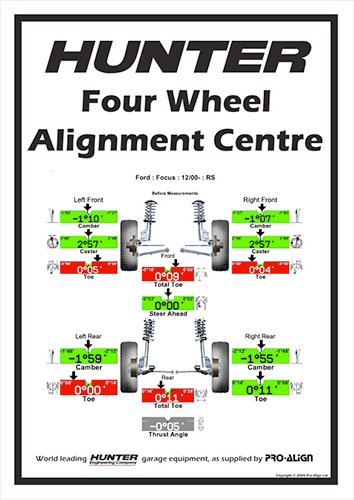 Wheel alignment is a procedure in which the wheels on your vehicle are aligned at such an angle to match the specification set by your manufacturer. Wheel alignment offers a multitude of beneficial attributes to your vehicle, for example it greatly improves the fuel efficiency whilst also reducing the wear on your tyre. As well as this it means that your vehicle handles optimally, and allows your wheels to spin without unnecessary vibration. Some people avoid having their wheels aligned as they see it as an extra cost, however if you take into account the amount of money you save on fuel and tyres, it’s a no brainer! Wheel misalignment is very common and almost unavoidable as it is caused by everyday things such as driving through a pothole or hitting a curb, as well as more serious circumstances like accidents. steering wheel not central when car is moving forwards. your tyres are wearing unevenly or excessively.